Welcome to BBQ Ribfest! For all you rockin’ blues, brews, and BBQ lovers we have got some of the best, most awarded, BBQ grilling teams and awesome rockin’ blues bands from across the country. This year, special thanks again to our presenting sponsor Blackburn & Green. Whether you prefer hot and spicy or sweet and tangy, your taste buds will never have it so good, unless of course you have been part of our party before. Ribfest is four days of unbelievably delicious, mouth-watering BBQ served up just the way you love it by National Award Winning BBQ teams from across the country. This year’s event starts on Thursday June 13th at 11:30 AM and ends on Sunday June 26th at 9:30PM. Each year upwards of 40,000 ribfeasters descend on Headwaters Park in downtown Ft. Wayne where over twenty-five tons of incredible BBQ is consumed during Ft. Wayne’s favorite summer festival. Brisket, ribs, pulled pork, rib sandwiches, bbq chicken, and so much more. It’s a BBQ lovers paradise! It’s all served up just the way you love it all while listening to some of the greatest live party blues music hitting the Coors Light main stage. The bands will be rockin’ on the river all weekend long! The massive canopied terrace at Headwaters park guarantees you will stay dry no matter what the weather. Once you are in the plaza you will be completely protected from the rain so…rain or shine the party is happening!!! So come on down and join the festivities under the giant canopy at the Headwaters Park pavilion. It’s Blues, Brews, & BBQ at it’s finest. 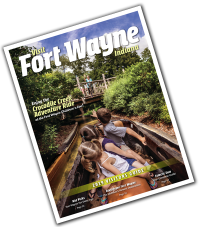 It’s Fort Wayne’s biggest summer piggin’ out in the park party. Great fun for all and ooooooooh so tasty! Voted one of the top ten RibFests in the nation by Martha Stewart Living Magazine in 2009!! Check out our amazing line-up on the band page. We’ll see you all there June 13th thru the 26th! Prepare to Pig out! 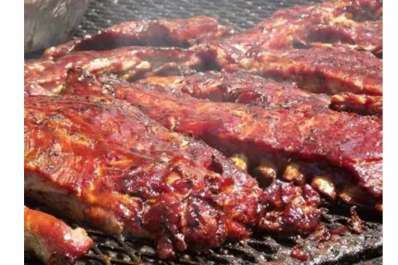 Best of all RibFest is free everyday until 5:30 and $3.00 all day Sunday! After that it’s $6.00 adults (13 and under free), $5.00 Seniors and $4.00 Students, Military, Police and Firefighters with ID. Prepare to Pig out! !